The iconic Ironman 30-Lap provides indispensable functions for athletes at any level. The classic styling is rooted deep in Ironman tradition, but updated with new functionality, design features and materials. The watch is packed with ideal features for your fitness, including a 99-lap counter, a 30-lap memory recall, and a 100-hour chronograph with lap or split option. This stylish sports watch also offers customizable mode sets and 15 presets, three alarms, three time zones, and a 24-hour timer. Perfect for night or day, the Timex has an all-day white reflector display and an orange Indiglo night light. The dial features a digital time display as well as a day, date and month calendar. 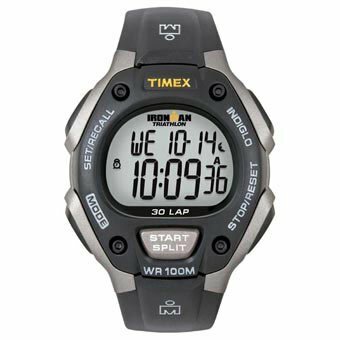 Water resistant to 330 feet, this sports watch comes with 6-year battery life and a 1-year warranty.